This week, the UK's three main parties joined forces to claim an independent Scotland would not be able to keep the Pound. This is further evidence of the increasing panic gripping Westminster over September's referendum, argues Yvonne Ridley. 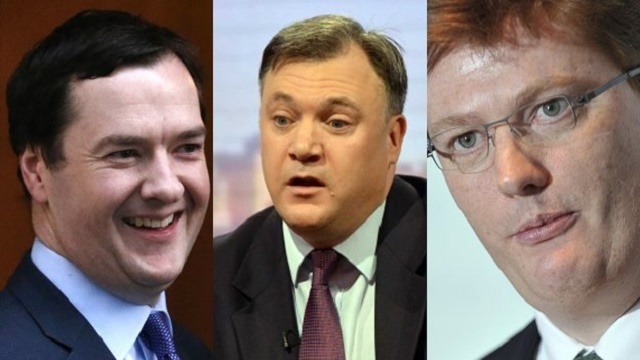 Now I’m not sure who is going to attack who in the unholy alliance formed between Tory Chancellor George Osborne, Lib Dem Danny Alexander or Labour’s Ed Balls and, quite frankly, I really don’t care. However, the three have come together to try and scupper Scotland’s First Minister Alex Salmond’s plan to keep the pound in an independent Scotland. It was a highly-unusual move since the three main parties in Westminster have already started knocking seven bells out of each other in preparation for the next General Election. But it seems they have called a temporary ceasefire to agree that whoever is in power after the election will block a formal currency union with the rest of the UK. (Incidentally, this also supports the theory put forward by some that UK voters have no real democratic choice these days as there’s little to differentiate the three main parties). Osborne justified the alliance by saying the pound was not like a CD collection to be divided in a ‘a messy divorce’, while Lib Dem Danny Alexander refused to allow the UK to be ‘exposed’ to Scotland’s risks. For his part, Labour’s Ed Balls accused nationalists of “not living in the real world”. Now while number crunching might be their area of expertise, quite clearly history is not. Every schoolboy and girl north of the Border knows that the Bank of England was founded by William Paterson, a Scotsman. The successful merchant, trading with the West Indies, proposed the creation of the Bank of England in 1691 and when it was founded three years later he became a director. The canny Scot recognised that Orange King William III and his Government needed lots of cash to pay for wars and a Government loan of £1.2m. at an impressive 8pc interest rate. was issued. The national debt became the stock of the Bank of England and it became the Government’s banker. Another piece of history of which the three politicians also seem to be unaware is that the Bank of England became a shared asset with Northern Ireland, England, Scotland & Wales when it was nationalised in 1946. Ed Balls’ political amnesia could be blamed on his New Labour credentials, but just to remind him the Bank of England was the first institution to be nationalised by Clement Attlee’s Labour Government followed closely by the coal, steel, power and rail industries. Attlee’s logic was that nationalisation benefited everyone, as they were publicly owned, and not just the wealthy few who owned shares in those industries. Nationalisation was a long-held belief of the old, traditional Labour Party, which put people before profit … who in the Labour Party remembers those days? The truth is, Westminster village is in a panic at the prospect of an independent Scotland which, according to polls, is becoming more of a reality as the referendum day in September approaches. The Tories are panicking because an independent Scotland is committed to getting rid of the nuclear facility in Faslane in its first term of government. This would jeopardize the UK’s nuclear power status and therefore its standing on the UN Security Council and possibly a seat at the G7/8. Labour is panicking because it knows the chances of ever regaining power in a country without Scottish voters is highly unlikely, so their power and influence would also diminish rapidly. And it’s quite clear from the antics of the Liberal Democrats that what hurts Labour and the Tories will hurt them as they’re obviously not fussy who they jump into bed with as long as they can sit on a few seats in the government’s front benches. Yvonne Ridley is a British journalist and a patron of the London-based human rights NGO cageprisonners.com as well as being the Vice President of the European Muslim League. Her website is www.yvonneridley.org and she's on Twitter @yvonneridley. Well said Yvonne I agree with every word you have said. I have been saying for ages that the lot at Westminster are needing to be reminded just who it was that started the bank of England and that it is NOT their Bank. As you say they are running scared, just like the last time Scotland ‘dared’ want to be come independent. I think they are also afraid that Wales might go down the same route and want their independence. A good article and very well written, making the points in a reasoned manner all of which bar one I agree with. The point I would like to correct is the myth that Labour cannot win power at Westminster without Scottish MPs as only twice since the second world was have Scottish MPs made a difference, in 1964 & 1974. I would like to raise the issue of the likelihood of a YES vote, since Gideon came north to bully us into submission the tide that had begun to turn is now surging forward to a positive result for Scotland. One of our great traits as a people is that when someone tells us from on high “No you cannae” almost universally our reaction is “Oh do you bloody think so? We’ll show you just how well we bloody well can!”. So thank you Gideon for refreshing the resolve of us Yes voters and for bringing over many of the undecideds to a Yes. As for Balls and his treachery he has just destroyed the Labour party here in Scotland by being seen to side against us. The thing is that the Tories have been toxic in Scotland for thirty years, and the liberals are really independents serving rural constituencies. What is new is that Labour is now making itself toxic as well, simply because UK elections are won and lost in the midlands and SE – so that when the rUK did vote the same way as us, in 1997, we got New labour instead. Osborne’s intervention last week was not unexpected, just early and panicky. Whhat is genuinely, viscerally shocking up here is Ed Ballls chiming in so unequivocally. Yvonne, you’re forgetting something. Nobody in England understands why the Scots want independence. We love them. They don’t love us. That’s how we see it. The English are going to be first bereived, and then angry. The dispute on the pound is only the first step. The divorce will be very, very ugly and Scots must realise that while Alex Salmond is a big man in Ediburgh, he is a small man in London where he has no friends, no goodwill and will face negotiators fiercely opposed to everything he stands for. Please do not be surprised if English politicians close ranks and give no quarter. Alex Salmond has profoundly mislead the Scottish people if they believe that independence can be had without pain, and with the English wishing them God Speed. And I say that as an Englishman that regards the Scots as fellow-countymen and valiant brothers-in-arms. I do say God bless Scotland, but most Englishman will not. Please, please realise that this isn’t going to be nice. As a civil servant in London in the 1960s, and being part of the establishment, I always accepted the general view that an independent Scotland would not be able to survive on its own without financial help from the London Exchequer. However, when in 1968 I was able to closely examine the UK’s “books” for myself in an official capacity, I was shocked to find that the position was exactly the opposite: that Scotland contributed far more to the UK economy than its other partners. And this, of course, was all before the oil boom. I realised that the Treasury would wish to keep this a secret, as it might feed the then-fledgling nationalistic tendencies north of the border. I decided to keep an eye on the situation to see how long it would take for the true facts to emerge, which I felt would only be a short time. However, the machinery of Westminster, aided and abetted by the media, did an excellent job of keeping the myth about “subsidised” Scotland alive. In fact it took another 30 years before the first chink in their armour appeared. This came unexpectedly on 13 January 1997 when, in reply to a series of questions put by Alex Salmond (then an MP) to the Tory government of the day, Treasury minister William Waldegrave admitted that Scotland had paid a massive £27 billion more to the Exchequer than it had received since the Tories came to power in 1979, or around £5,400 for every Scot – a statistic which received barely any media coverage. A year later, with a Labour government now in power, came a further bombshell. Following further promptings by the SNP, on 21 August 1998 Mr Salmond received a letter from the House of Commons Library (ref. 98/8/56 EP/rjt) which gave a table showing that based on Scotland’s GDP per capita, Scotland would occupy 7th place in the OECD wealth league. A second table showed that the UK was in 16th place. The UK government now refuses to release the first table to the public. Looking closely at the figures a few years later and taking the year 2006 as a benchmark, I found that Scotland had an annual relative surplus of £2.8 billion, which works out at £560 a year for every man, woman and child. In contrast the UK had a deficit of £34.8 billion. The prophecies of the 1975 McCrone Report, which successive Labour and Tory governments had desperately suppressed for three decades, had been borne out. The alternative future Scotland had been robbed of over the years is illustrated in the UN’s “Human Development Index”. The closest thing to a league table of the world’s best countries, in ranks nations on such factors as generous welfare payments, education, high income and a long life expectancy. In 2013, for the 10th time in the last 12 years, oil-rich Norway topped the list. A country the size of Scotland with broadly comparable oil resources, Norway had of course wisely created an “oil fund” in 1995, which just five years later had reached a total of £250 billion – enabling the Norwegians to sail through the credit crunch despite having delayed the starting of the fund for 20 years. Since 2000 the value of that fund has more than doubled to £0.51 trillion. With the oil boom, Scotland’s economy should have been transformed. Scottish oil has to date funded the Treasury with the lion’s share of £300 billion, which would have pushed Scotland up from a notional 7th place in world wealth rankings (had it been in control of its own resources), to 3rd place. Current industry estimates suggest that there are at least 40-50 years (and perhaps twice that) of significant North Sea production remaining, with a total value in excess of £1 trillion and possibly as high as £4 trillion according to independent experts. It’s not all about oil. It is no longer disputed that Scotland exports more per capita than the rest of the UK. In 1968 when I first discovered that Scotland was in surplus in relation to the rest of the UK, its exports could be broken down into whisky, meat, timber, fish, and of course tourism. Whisky exports alone, which even in 1968 were one of Scotland’s top assets, have risen at a phenomenal rate. For example, sales of the spirit to China rocketed in just eight years between 2001 and 2009 from £1 million to £80 million. But Scotland’s real riches do lie in energy. The country exports 24% of its surplus electricity south of the border, with much of the back-up provided by hydro power unused. And even without nuclear, the future looks bright. The Glen Doe hydro station on Loch Ness which was opened by the Queen in 2009 but almost immediately closed again by a massive construction flaw, reopened last year and can produce enough electricity for 240,000 homes – the whole of Glasgow – by itself. Further projects down the Loch are planned to eventually increase this to over 1,000,000 homes – enough for almost half of Scotland. Wind and wave energy will also contribute significantly in the future, as Scotland takes hold of a renewable-energy bonanza which will dwarf the proceeds of North Sea oil, and never run out. There is, of course, a reason that the Unionist parties and media focus on the latter, finite, resource rather than the endless former one. The No campaign is, in more ways than one, a massive confidence trick. Thank you everyone for contributing and making your points in a respectful and meaningful way – there are lots of interesting points and perspectives. Alex Salmond and his cohorts are doing the people of Scotland a disservice, they are looking backwards not forwards, Mr Salmond wants to be another Scots hero, but he is not fit to fill a shoe, I have worked in Scotland, have scots friends, worked with them etc, I like others in England are now thinking of Scotland and its people as a foreign nation, it will get even worse if they vote for indpendance.